"An authentic Greek salad from Oia, Santorini in Greece. Traveling through Greece, I feel in love with the Greek salads on the islands because they had no lettuce. When I came home, I was determined to replicate that salad for family and friends. This is a great green salad recipe because extra salad can marinate in the dressing overnight and be eaten the next day in pita pockets as a sandwich." 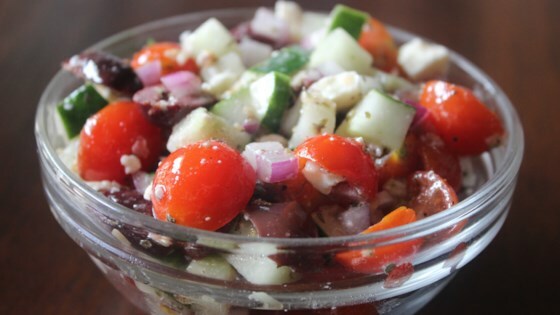 1/4 cup Greek salad dressing, such as Yazzo! Keep all of the ingredients separate until ready to serve so the onion doesn't overpower everything. To prepare the salad, toss the cucumber, tomatoes, feta cheese, capers, onion, and salad dressing together in a large bowl until evenly coated. Sprinkle with the Greek olives to serve. I just use olive oil and sometimes balsamic vinegar to dress this salad. Capers are a nice touch, as are red peppers. Also AMAZING with fresh dill. What a great change from a normal green salad. Very good. Thanks.